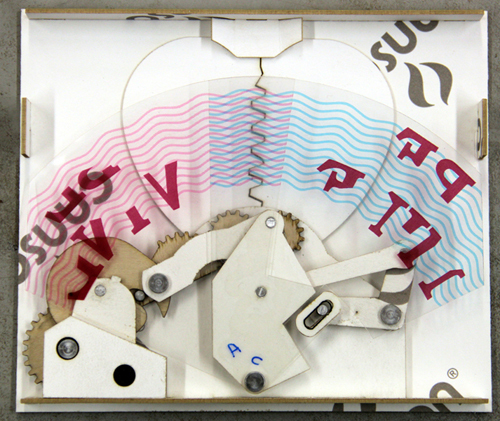 Bradley Litwin of Philadelphia is the inventor of hand-operated kinetic sculptures called MechaniCards. Brad wrote to ask if I thought readers would be interested in learning how he makes these unique cards. Valentine's Day is approaching; good timing! I hope you'll enjoy seeing a bit of the behind the scenes operation that takes place in the workshop of this interesting and self-taught engineer, artist, and musician. Brad's first step is to create an illustration that he prints on adhesive paper and adheres to high-density paperboard. The first few MechaniCards prototypes were cut by hand with a #11 razor knife, including the gears. 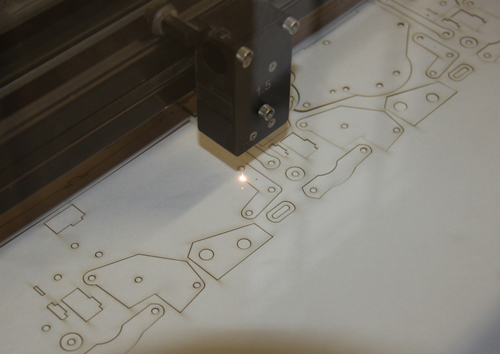 Now he uses a computer-controlled, high precision, CO2 laser cutter/engraver. 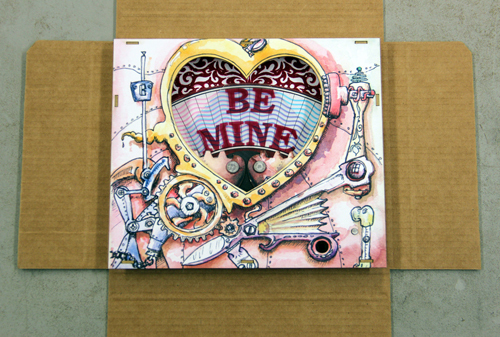 Including the rivets, crank, and corrugated mailer or wooden display box, this Valentine model has 48 parts that are assembled in a reliable, repeatable way. 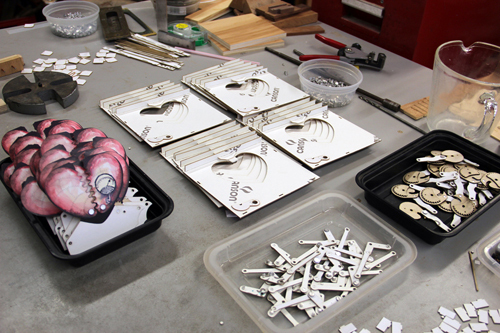 Where slot and tab assembly isn’t practical, custom gluing jigs are made to accommodate precise parts placement. Design of these can be a challenge due to irregularly shaped parts. 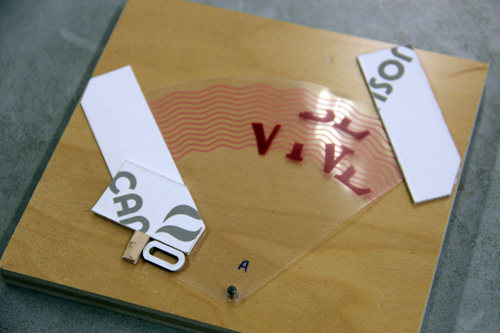 All of the glued assemblies are put together with high viscosity cyanoacrylate. The transparent graphic panes are laser-printed polyester, ordinarily used for overhead projection slides. Aluminum rivets provide the pivot for linked and rotating parts. A custom-made pressing tool flares the end of the rivet just enough to secure the paperboard part without crushing it or permanently binding the two parts. Forgive me... 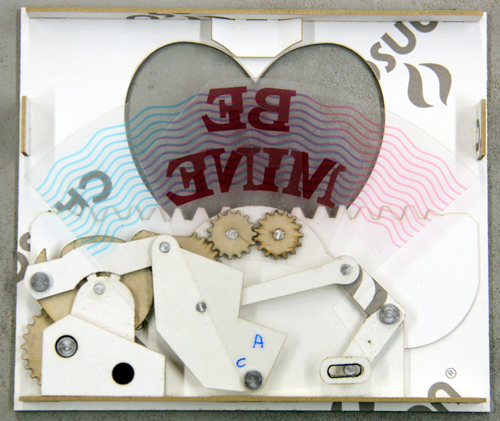 I've made the executive decision to skip ahead many steps to the happy ending where one gear smoothly turns another and another - a hand crank is rotated, the panes cross, and a Be Mine message appears. Sweet! Brad signs and numbers each card, glues it to either a wooden display box or corrugated mailer, includes simple operating instructions, and sends it on the way to a special someone. 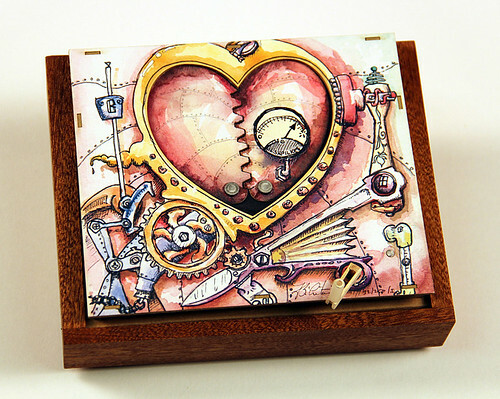 Enjoy seeing the Valentine in action and find a variety of card designs at MechaniCards. Learn more about Brad at Kinetic Works. Such a delightful card. Thanks for sharing the video Ann. Clever! And so well executed. Have to appreciate the thought process and craftsmanship. Big like. 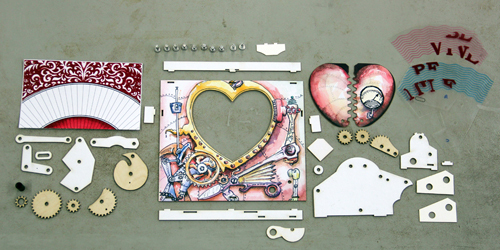 Amazing contraption and beautifully executed! I've seen Brad's cards before and I'm always amazed by them. They are so creative and he is so inventive. It's always nice to see the newest things he is doing - thanks for sharing this one. I love, love, love this artists work. Mechanical cards always amaze me. I also collect pop up books.